PDP presidential aspirant, Atiku Abubakar. He said his case was based on facts and statistical evidence and challenged both the Independent National Electoral Commission (INEC) and the APC, to disprove what he termed 'factual submissions' rather than bringing in the baseless allegation of citizenship. "The fact that the APC chose to base its defence on the ridiculous assertion that the Waziri Adamawa is not a Nigerian should show to Nigerians the type of characters we have in the APC and its government, whose legitimacy runs out on May 29, 2019. "Our lawyers would, of course, do the needful in court. "I am, however, confident in the Nigerian judiciary, as well as in the Nigerian people. I trust that the Tribunal will treat such a claim with the contempt it deserves. "We must maintain our fidelity to the rule of law and to our fountain of origin, the 1999 Nigerian Constitution (as amended). 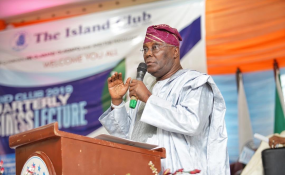 "Atiku Abubakar has served our nation diligently in various capacities, form the civil service, where he rose through merit, to the top of his chosen field, to public service, where, by the grace of God, he was the Vice President of the Federal Republic of Nigeria. "I make bold to state that those who have made Nigeria the world headquarters for extreme poverty are the very people whose Nigerianness should be in doubt, and not a man, who worked with President Olusegun Obasanjo to double the per capita Income of our nation in less than eight years," he said.